The statue of Nelson Mandela outside Victor Verster prison near Paarl. Following on from winter, the early summer is as always an exciting time - the south easter wind, the Cape Doctor as we call it, is blowing hard and will probably carry on until the harvesting season in early February. The wind and the spectacular white clouds that come with it are so very much a part of the Cape and its presence guarantees much needed rain to fill the dams in the northern half of the country. 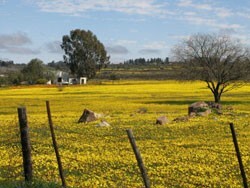 Namaqualand’s spring flower display was stunning. Here's a few words on recent events to help planning for future visitors. Many of these are natural attractions that happen annually and bring pleasure to everyone. One such is the wild flower display in Namaqualand up the West Coast of the Cape. We have been going up to see the wild flowers in Namaqualand for some ten years now, but never have we seen it as beautiful as this year. It is impossible to describe just how stunning it is and so we've included some pictures to show you. In my opinion the flowers of Namaqualand at their best rival Table Mountain, now voted as one of the world's seven natural wonders. One word of warning, of course, is that they have to be seen in full sunshine because the flowers decide themselves whether they are to perform or not. In the Winelands itself a number of festivals have taken place over the last few months adding extra buzz and excitement to the area. Events such as the Stellenbosch Wine Festival, the Bastille Festival in Franschhoek, the Classical Music Festival, jazz festivals, the Oude Libertas Summer Series of concerts all are stimulating and fun and others in neighbouring towns such as Robertson and Paarl provide the opportunity to taste the best of the best in one place. I attended the Champagne and Cap Classique festival in Franschhoek in early December and in all my years in the industry I've never experienced such fun and joy and good spirit. The display was fantastic and the venue superb as was agreed by the large number of people. This is one event not to be missed. The magazine Eat Out select their best restaurants in South Africa every year, and it is wonderful to see that six out of the top ten are based in the Winelands. It certainly boosts the claim that Franschhoek is the food and wine capital of South Africa. The coming year's harvest promises to be a vintage one. With a long and wet winter providing a rest for the vines, the shoots look healthy, the South Easter is well timed, and there is little that can stop us having another bumper crop. The harvest will probably start in early February and last until late March. A change designed to draw a lot of interest next year is the moving of the Stellenbosch Wine Festival from its present venue on to the streets of Stellenbosch. Although the dates have not been announced as yet, it is expected to take place in the second half of 2012. And while talking about the streets of Stellenbosch - visitors and residents alike are surprised by the number of sculptures that are now dotted around the town's streets. This is the result - and a spectacular one- when a number of well-known artists decide to take their works to the people for the coming year and maybe longer. With an increasing interest in all aspects of art in the Winelands there are now some 13 art galleries in Stellenbosch as well as some of the wine estates. Old masters are on exhibition together with works by young and upcoming artists. 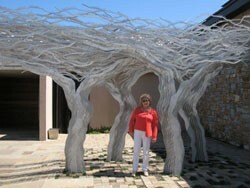 Excellent examples of the Wine & Art campaign can be seen in the sculpture around the gardens at Tokara wine estate. Perhaps in the foreseeable future we shall be known as the Food and Wine and Art Capital of South Africa! Our recently introduced Captivating Cape Town tour is now featured on the website www.wine-tours.co.za and has attracted much interest. Only two people are taken at any one time and collection to and from hotels plus a light lunch is included. This VIP status tour has an itinerary that includes Kirstenbosch botanical gardens, the Houses of Parliament in central Cape Town and Simonstown the naval base. Chapmans Peak, Camps Bay and the Waterfront are also featured as well as sports complexes including the soccer stadium "Bedpan" built for the 2010 football world cup. A full itinerary is available and reservations can be made with the bookings office on 00 27 21 7617687 or by email at alexmark@mweb.co.za. Commission is payable to tour operators and the cost per person is R1,850. Included are pics of some of our visitors from the last few months. There are too many to include them all but there's Eric and Pauline Leyns who spent two days with me. I took them through the Bains Kloof pass from Wellington, a spectacular old mountain pass leading to "the other side of the mountain", as it is called here, and where the climate and vegetation is dramatically different. 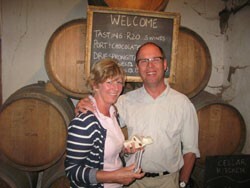 Mike and Cathy Hill enjoyed the rustic atmosphere at Muratie wine estate. 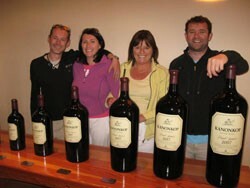 Steve and Karen Browne and Darren and Elaine Higginson with Kanonkop’s finest, arguably the most famous of all. Barbara Nella in the shade of one of Tokara’s works of art. 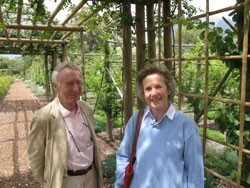 The wonderful gardens of recently opened Babylonsforen were enjoyed by Eric and Pauline Leyns. 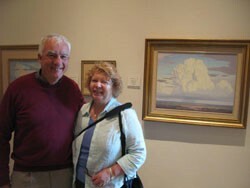 Graham and Mary Craddock in front of one of the famous paintings of Pierneef at La Motte Wine Estate. The collection is of great artistic and cultural value and not to be missed in the Franschhoek Valley. La Motte also has a huge collection of French tapestries by Lurcat, the Famous French tapestry artist. Spending more time with visitors is perfect as it provides the opportunity for unique detours and other visits impossible to fit into one day. As I write, Clive and Nicola Brenchley are doing just that. We enjoyed a day around the Peninsula to be followed by a tour of the Winelands a few days later. Like most cities at the height of the summer season Cape Town suffers from too much traffic. There are many fantastic hotels and country houses in and around Stellenbosch and Franschhoek and we suggest that those wanting to tour the Winelands stay in the area. Those planning a Captivating Cape Town tour will perhaps find it more convenient to avoid booking in the Camps Bay and Clifton areas which tend to become very congested. All bookings should be made with Susan Alexander in the Reservations department tel +27 (0)21 761 7687 or cell +27 (0) 722 719072, email alexmark@mweb.co.za. Clients requesting holiday planning assistance will be referred to the most suitable tour operator who may be able to provide help with hotels and travel details within South Africa. Recognised tour operators in the UK and Europe are invited to send South African planning staff visiting South Africa for a one day 'See the Winelands' with Pietman. Enquiries may be made with the reservations department regarding available dates. Arrangements have been made to include other European languages with our tours. As well as English, Afrikaans and Dutch, French has been added recently. We wish all our readers a wonderful festive season and hope to see many of you returning to captivating Cape Town and the Winelands in the new year.